If you had 80,000 LEGO bricks at your disposal, what would you do with them? 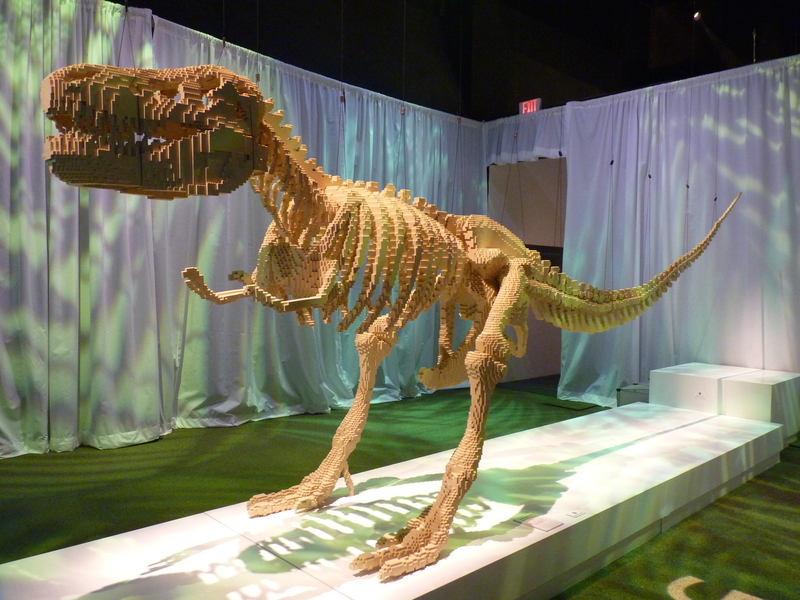 Corporate lawyer turned artist Nathan Sawaya used his to build a 19-foot long dinosaur that’s currently on display with dozens of his LEGO sculptures at Discovery Times Square, an exhibition center on West 44th Street. The dinosaur is one of the largest sculptures he’s ever made. The exhibition in New York (The Art of the Brick) is an interactive dialogue with the audience, starting with a short video where the artist tells his story, and continuing with comments and questions next to each piece of art. Sawaya loved LEGOS as a kid, and even took some with him when he went off to college at NYU. He became a lawyer, and after working at a law firm all day he would go home at night and decompress over a LEGO set, until eventually he embraced his inner artist. “My own personal conflicts and fears, coupled with a deep desire for overall happiness, paved the way to becoming a full-time working artist,” Sawaya tells visitors. From framed recreations of famous paintings such as the Mona Lisa and Edvard Munch’s The Scream, to sculptures of Michelangelo’s David and Degas’ Little Dancer, to a lighthearted peace sign and Lady Liberty, prepare to be blown away – whether you are 5 or 55. The artist says he gets much of his inspiration from everyday life and the people he comes across. “Many of my works center on the phenomena of how everyday life, people, and raw emotion are intertwined,” he writes. As you leave the exhibition, you can write your name on a LEGO brick, for Sawaya to incorporate into a new sculpture. Adult tickets are $22.50 and grant you access at a specific date and time. Full disclosure: The press office tacked my brother onto my press pass. He is closer in age to 55 than to 5, and he loved it. lego inspiration for the holidays!